Make Your Own Colloidal Silver, the Antibiotic made at home! The Silver Pulser Constant Current is a 2-in-1 unit. 1. It generate ionic colloidal silver using 99.99% pure silver electrodes 2. I is a Bio-Stimulator Click Here for more information on the Beck Protocol and includes plant growth stimulator probes based on the research of Bob Beck. Includes battery powered base unit, 99.999% pure silver electrodes, silver stimulator probe, two Velcro/Neoprene straps, two cotton Probe Sleeves, operating instructions, carrying case, and 3-year manufacturer warranty. The Silver Pulser is a dual function unit 1. Bio-Stimulator Click Here for more information on the Beck Protocol and 2. Ionic/Colloidal Silver Generator with Constant-Current. The Silver Pulser generates the finest quality Ionic Colloidal Silver at a rate of 5-8 ppm (part per million) in 2 Hours for 16 ounces of distilled water, with an Ionic Colloid silver particle size that is mostly ions, with colloidal particles in the range of 0.005 - 0.015 microns (Verified on a Scanning Electron Microscope). The ZBB5 Model has a built-in Constant-Current Circuit for the ultimate in Ionic/Colloidal Silver Production. The Silver Pulser has two attachments: one is to make ionic/colloidal silver and the other is for bio-stimulation. What is "The Silver Pulser"? Built-in Constant-Current Circuit for the Ionic/Colloidal Silver Output. Yellow LED Light indicates when the current through the stimulator electrodes is correct and functioning. Special DIN style jack to comply with new government regulations. The Silver Pulser is a dual function unit 1) Bio-Stimulator and 2) Ionic/Colloidal Silver Generator with Constant-Current. The Silver Pulser uses only the highest quality .9999 Pure Fine Silver Electrodes. Our Assay Certificate for Silver Electrodes is on file, and can be viewed by clicking HERE. Our Certificate of Compliance for Silver Electrode Purity is on file, and can be viewed by clicking HERE. The Silver Pulser generates the finest quality Ionic Colloidal Silver at a rate of 5-8 ppm (part per million) in 2 Hours for 16 ounces of distilled water, with an Ionic Colloid silver particle size that is mostly ions, with colloidal particles in the range of 0.005 - 0.015 microns (Verified on a Scanning Electron Microscope). The ZBB5 Model has a built-in Constant-Current Circuit for the ultimate in Ionic/Colloidal Silver Production. To see independent lab tested results of our Ionic Colloidal Silver as an anti-bacterial solution please click HERE. The Silver Pulser has a Bi-Phasic output frequency of ~3.92 Hertz (cycles per second) at a nominal voltage of 31 VOLTS DC peak per cycle. The Bio-Electric Protocol has changed. We boosted the output voltage from 27 Volts to 31 Volts (from 54 Volts Peak-Peak, to 62 Volts Peak-Peak). A new intensity control was specified to help widen the band of the output control to avoid "bunching" the signal near the high end of the control knob. A unique circuit design allows The Silver Pulser to operate from a single 9 Volt alkaline battery. Original plans actually called for the use of 7 batteries in the design. Our state-of-the-art electronic design utilizes a proprietary DC-DC converter which boosts the output of the 9 Volt battery to the 31 Volts DC required by The Silver Pulser. Constant-Voltage Output - Unique circuitry maintains the required 31 Volts output regardless of battery voltage or other input power (like from an AC-DC Wall Adaptor, Automobile Battery, or Solar Panel). Thus, as the battery runs down or if the input voltage fluctuates, the output will maintain the 31 Volts. No other unit using either 3 x 9 Volt batteries or voltage triplers can offer this very important feature. We use only the purest, Fine Silver rod Wire Electrodes, 4 Nine Grade (.9999 pure) for the Ionic-Colloid Silver production. Constant-Current Output - ZBB5 Model has built-in Constant-Current Circuit for Ionic/Colloidal Silver production. Output monitoring circuit and indicator. The Bio-Stimulator Probes are of the highest quality. Our Electrical Circuit Boards are GOLD Plated for extreme reliability and workmanship. All electrical wire connections made with Food Grade solders and fluxes for the highest in safety and purity. 3 Year Parts and Labour Warranty on all internally mounted components. Replacement Fine Silver Electrodes and Probes are available. The Silver Pulser is housed in an attractive new custom plastic enclosure with a built-in compartment for the 9 Volt battery. A slide-off lid allows you to change the battery easily. A Thumbwheel Switch Control Knob turns The Silver Pulser on and off and varies the intensity of the "Bio-Stimulator Probe" output. A Green LED Light comes on when the Silver Pulser is turned on. A flashing Yellow LED light on the unit indicates there is a correct Bio-Stimulator output and comes on only when current is flowing. 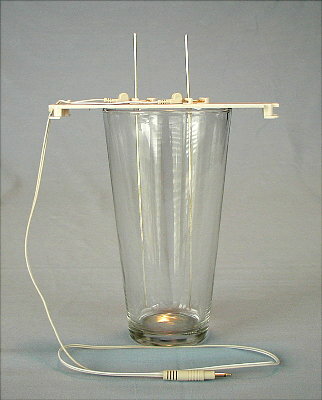 An Orange LED light is used for the Ionic-Colloidal Silver generation. The Orange LED Light comes on only when current through Silver electrodes is correct and the circuit is complete. A Red LED Light indicates low battery. The Silver Pulser is packaged in a custom soft carrying case for easy storage. Electronics: The Silver Pulser is designed to the highest standards. We have improved on the design with added features. Our electronic design is unique and efficient making the unit very portable and light-weight. There's even a provision for adding an external power source to save on batteries when making Ionic/Colloidal Silver, such as an AC-DC Wall Adaptor which you can purchase from any electronic store. Optional Input Voltage: 6 - 12 Volts DC @500mA Wall Transformer/Adapter, Automobile Battery, or Solar Panel. Ionic-Colloid Silver Production: 5 - 8ppm (parts per million) for 2 hours for 16 ounces distilled water. Ionic-Colloid Silver Particle Size: Mostly ionic, with colloidal particles in the range of 0.005 - 0.015 microns when made as directed. Ionic-Colloid Silver Colour: Clear or Pale Gold. Silver Electrodes Life: Can make many gallons ionic/colloidal silver per set of Fine Silver Electrodes, when made as directed. Output Voltage at Stimulator Probes: 31 Volts (Peak per Cycle, 62 Volts Peak-Peak) Bi-Phasic at ~3.92 Hertz (cycles per second) +/- 1 Hz. To see the actual output waveform from the oscilloscope, please click HERE. Note the extremely square and symmetrical waveform; free of any spikes or artifacts. Output Current at Stimulator Probes: ~12 milliamps maximum when probes shorted and Control Knob on full intensity. The Fine Silver Electrodes are 14 AWG (1.63mm or 0.064" dia.) x 8" long (20 cm) and are constructed of only Pure Fine (.9999 pure) Silver Wire Electrodes. Bio-Stimulator Probes are 1/8" diameter x 1.25" long (3mm diameter x 3.8 cm long). Weight of The Silver Pulser unit is only a few ounces - very lightweight.